Eugene Marlow is an award-winning composer/arranger, producer, presenter, performer, author/journalist, and educator. Dr. Marlow’s jazz compositions include charts for big band in various genres, plus ballads, swing tunes, blues, and Latin-jazz flavored compositions for small ensembles. He has also arranged numerous Hebraic melodies in various jazz, Afro-Caribbean, Brazilian, and classical styles. Overall, in addition to the jazz (and classical) compositions and arrangements that appear on his 19 indie produced albums (MEII Enterprises), his compositions appear on eight other albums produced by other labels. For example, four of his big band charts appear on four Grammy-nominated albums: Marlow’s bembe arrangement of “Maria” from “West Side Story” is the initial track of CD#2 of Bobby Sanabria’s “West Side Story Reimgained” 2018 Latin-Jazz category Grammy-nominated album (Jazzheads 2018). Marlow’s big band chart “El Aché de Sanabria (en Moderacion)” appears on Bobby Sanabria’s 2007 Grammy-nominated album “Big Band Urban Folktales” (JazzHeads). His reconstruction and orchestration of “Me Acuerdo De Ti,” recorded by Tito Puente with Celia Cruz, appears on the 2011 Latin-Grammy nominated “Tito Puente Masterworks Live!” (Jazzheads) recorded by the Manhattan School of Music Afro-Cuban Jazz Orchestra. 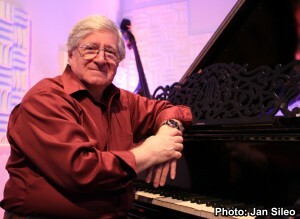 Marlow’s big band arrangement of his original “Broken Heart” duet for piano and alto saxophone appears on Bobby Sanabria’s 2012 Grammy-nominated “Multiverse” album (Jazzheads). His original big band chart of “Let There Be Swing” appears on the Manhattan School of Music Afro-Cuban Jazz Orchestra’s “Que Viva Harlem” album (Jazzheads 2014). His song “Sweetness” arranged by Joseph C. Phillips, Jr. appears on “Numinous” released in 2003 (Numan Music). A one-minute electronic work appears on “60×60” (Capstone Records 2004). His “Memories & Reflections” appears in a compendium of “blues” entitled “Oasis Blues” (2006) and his quasi-blues/Latin piece “Take-A-Break” can be found on “Jazz” also released on the Oasis label (in 2007). His jazz compositions have been performed by the BMI Jazz Composers Workshop Big Band, the Primary Colors Trio, the SYOTOS Latin/Jazz Band with Chris Washburne, The Numinous Orchestra, The Andy LaVerne Trio, The Trevor Day Big Band, Manhattan School of Music Afro-Cuban Jazz Orchestra, New School Afro Cuban Jazz Orchestra, George Gee Big Band, Bobby Sanabria Big Band, The Louis Armstrong Foundation Summer Camp Big Band, and The Cyrus Chestnut Trio (2011 Montreal Jazz Festival). Marlow has studied jazz with NEA Jazz Master Dr. Billy Taylor, Andy LaVerne, Harold Danko, and Marty Sheller (jazz composition), Milt Hinton and Laurence Hobgood (jazz performance), multi-Grammy nominees Manny Albam, Michael Abene, and Jim McNeely, and Grammy-winner Maria Schneider. He has studied music scoring for film and television with Paul Chihara (at ASCAP), Scott Smalley, and Jack Smalley. He is a former member of the BMI Jazz Composers Workshop and the International Association for Jazz Education, and current member of the Jazz Journalists Association (former treasurer), the Jazz Education Network, the New York Composers Circle, Chamber Music America, the American Composers Forum, and the National Music Publishers Association. He has been a voting member of the National Academy for Recording Arts and Sciences since 2006. Classical solo and chamber works have been performed by the Kandinsky and Corigliano String Quartets, the Circadia Woodwind Quintet, the Sylvan Winds, the Alaria Chamber Ensemble, the Damocles Trio, Musica di autori Americana dalla New York University (Italy), the Glass Farm Ensemble, The Bateira Trio, The North/South Chamber Ensemble, and virtuoso pianists Nataliya Medvedovskaya, Natalie Synhaivsky, Nada Loutfi, and Shiau-uen Ding. An electronic three voice serial fugue–“48 Rows in One Minute”–was featured in the November 2003 performance of 60×60, a concert organized by VoxNovus (New York City). The 60×60 project also received a performance in Bucharest, Romania and at Brooklyn College (New York City), both in March 2004. A second electronic piece (“Arturo’s Reverie”) based on an improvised theme by jazz pianist Arturo O’Farrill for Marlow’s “Wonderful Discovery” album, was choreographed by Jeramy Zimmerman/CatScratch Theatre at Galapolus Performance Space (Brooklyn, NY) in September 2008. For a time Marlow studied classical composition privately with 2004 Pulitzer-prize winning composer Paul Moravec. He has also studied with Maurice Peress (former Associate Conductor of the New York Philharmonic under Leonard Bernstein), and multi award-winning composer George Tsontakis. In 1998 Dr. Marlow completed a CUNY BA in music composition, followed by a master’s in music composition at Hunter College in 2001. He has since completed doctoral level work in music at the Graduate Center of the City University of New York. Eugene Marlow has posted 26 albums and single tracks on his MEII Enterprises indie label. His label now presents 12 artists (including himself) in the jazz, Latin-jazz, classical, and world categories. His albums can be found at www.cdbaby.com/artist/eugenemarlow. His indie label can be found at www.meiienterprises.com. “A Fresh Take.” Nine tracks (MEII Enterprises 2011). A third album from Eugene Marlow’s Heritage Ensemble. Early reviews from allaboutjazz, Celebrity Café, Buffalo News, and Midwest Record. “Celebrations: Eugene Marlow’s Heritage Ensemble Interprets Festive Melodies from the Hebraic Songbook.” Nine tracks. (MEII Enterprises 2010). Reviewed in over two dozen online and print publications, including LA Times, allaboutjazz, and jazztimes. Radio play in the United States, Canada, and Europe. October 2010. “A Bouquet of Classical and Jazzy Love Songs from the Pen of Eugene Marlow” (MEII Enterprises 2009), a potpourri of selections from Marlow’s “Summer Afternoon,” “Wonderful Discovery,” and “Les Sentiments D’Amour” albums. “Making the Music Our Own,” arrangements of nine Hebraic melodies in various jazz, Afro-Cuban, Brazilian, and neo-classical styles (MEII Enterprises, March 2006). Distributed to radio stations in 19 countries, including the United States. Reviewed in All About Jazz, Jazz Improv. “A Summer Afternoon With You,” a collection of 10 original pieces for jazz quintet (MEII Enterprises, October 2005). Aired on jazz radio stations in 22 countries (including the United States). Remained on the JazzWeek Top 50 chart for 10 weeks, 260+ weeks on Australian radio, three weeks on the Top Seven XM Radio Real Jazz channel chart. Reviewed in Jazz Improv, Montreal Mirror, and Oregon Jazz Society. In addition to composing and arranging, Dr. Marlow is the leader/founder of The Heritage Ensemble, a quintet dedicated to recording and performing Marlow’s original compositions and arrangements of Hebraic melodies in various jazz, Afro-Cuban, Brazilian, and classical styles. He received a 2010 “Meet The Composer” grant for his work with The Heritage Ensemble. A four+ minute video of The Heritage Ensemble can be found at www.youtube.com. Search: Eugene Marlow’s Heritage Ensemble. Marlow also leads The Gene Marlow Ensemble, a group ranging in format from duet to sextet that performs at various private events in the New York Metropolitan area. Marlow was senior curator of the Milt Hinton Jazz Perspectives concert series at Baruch College (The City University of New York) from 2000-2018. An original member of the Hinton Committee when it was formed in 1992, Marlow was appointed co-chair in 2000. He immediately expanded the series from one concert to four events a year—in October, December, February (to coincide with Black History Month), and April (to coincide with Jazz Appreciation Month). Dr. Marlow is also formerly Director, Media Relations, for the New York Composers Circle. Formerly also the organization’s treasurer, Marlow helps produce NYCC’s four-concert season as a member of the group’s Steering Committee. Dr. Marlow has published 12 books dealing with communications, technology and culture and 400+ articles and chapters that have been published in professional and academic journals in the United States, Germany, Greece, Japan, China, and Russia. His latest book is entitled Jazz in China: From Dance Hall Music to Individual Freedom of Expression (University Press of Mississippi 2018). Marlow was a regular contributing editor to www.jazz.com. For this work, Dr. Marlow received the prestigious 2010 James W. Carey Award for Journalism Excellence from the Media Ecology Association. He also contributes to Chamber Music Magazine and JAZZed Magazine. Marlow writes a blog on music, media & culture at The Marlowsphere Blog (www.eugenemarlow.com). For almost a quarter century Dr. Marlow served as president of Media Enterprises Inc, a media production firm that served over 100 domestic and international clients in the media, technology/manufacturing, healthcare, financial services, consumer products, and non-profit sectors. He worked with numerous celebrities and high level executives during the course of producing over 350 video and 125 radio programs and commercials in various marketing, public relations, and corporate communciations applications. Marlow received two dozen awards for programming excellence from the New York Festivals, Questar Awards, the Tellies, the Society for Technical Communication, INTERCOM, the International Television Association, Information Film Producers of America, U.S. Industrial Film Festival, CINE, and the International Film and Television Festival of New York. He is currently working on a documentary based on his forthcoming book Jazz in China: From Dancehall Music to Individual Freedom of Expression. “Jazz in China” is Dr. Marlow’s most recent documentary project. Prior, he co-produced “Shakerism: The First Two Hundred Years” (1976), re-released by MEII Enterprises in 2011 as a 30-minute DVD (B&W). In August 2015 he completed a 10-minute DVD entitled “Zikkaron/Kristallnacht: A Family Story,” a video overview of “The Night of Broken Glass” in 1938. The video serves as an introduction to a live lecture. Dr. Marlow is a professor at Baruch College (The City University of New York) where (since 1988) he teaches courses in media and culture. He is a senior member of the Department of Journalism & The Writing Professions. Professor Marlow has received distinguished teaching awards and fellowships from the Direct Marketing Educational Foundation and the Poynter Institute for Media Studies. He is a seven-time honoree, Weissman School of Arts and Sciences Authors, Editors, Artists/Performers annual reception (1996-2002), and has been an honoree at Baruch’s Annual Faculty Recognition Ceremony, A Celebration of Faculty Scholarship and Creative Achievement every year since 2003. Marlow holds five degrees: Ph.D. (Media Studies/New York University, 1988), MBA (General Management/Golden Gate University, 1972), MS (Music Composition, Hunter College, 2001), BS (Music Composition/CUNY, 1998), BA (English/Hunter College, 1966).